PolarTREC is funded by the National Science Foundation and provides science teachers (grades 6-12) the opportunity to participate in polar research and work closely with scientists as a pathway to improving science education. For approximately six weeks starting in November 2018, Mr. Penn will be working as part of a research team from the University of Wisconsin to install and maintain remote automatic weather stations all over the continent of Antarctica. Mr. Penn and the research team will be based in both McMurdo Station and South Pole Station, Antarctica. The automatic weather stations collect information about weather conditions and measurements that are used by meteorologists and climate scientists all over the world. In addition to being a full member of the research team in Antarctica, Mr. Penn’s responsibilities also include outreach to students and the public about what he will be doing in order to foster an interest in math and science and general knowledge about the Antarctic. Mr. Penn will be communicating with students, schools, and the public, explaining his role in the Automatic Weather Station project, conveying his observations, responding to questions, and most importantly, inspiring students to become interested and active in scientific issues that affect the world. Mr. Penn will be chronicling his adventures and work through a variety of online activities that will be available to his students at Shaler Area and around the country. 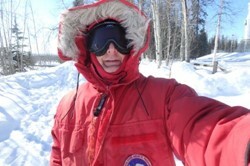 “I am really looking forward to interacting with our students and teachers through journals and video conferencing and to answer their questions about the AWS project, Antarctica, its climate, geography, animals, how we will get around on ‘The Ice’ and anything else they are curious about,” Mr. Penn said. As part of his outreach work, Mr. Penn is available to give presentations to students and classes both before and after his deployment to talk about Antarctica’s geography, climate and conditions, clothing he will be issued, modes of travel, his job, and the research. In addition, Mr. Penn is inviting classes to make a small banner or flag (no larger than 8.5x11) that he could take with him. He will take a photo of himself holding it in Antarctica and return the photo and flag to the classroom. Mr. Penn also will take self-addressed U.S. stamped postcards to be mailed from the “post office” in Antarctica (with the Antarctic post mark). Questions about arranging for Mr. Penn to visit a classroom, what the research entails, or about the PolarTREC program can be directed to pennm@sasd.k12.pa.us.